Steps from private beach, screened-in wraparound porch, water views. A vintage beach house that's been in our family since 1945. It was built in 1924, modernized in the 1950s and lovingly maintained/updated by our family ever since, with new roof, foundation, etc. as needed. We visit twice a year to open and close, and rent in between. Located in last community before the undeveloped Griswold point reserve at the mouth of the CT River. Guarded entry to four street, safe walking community of 100 houses. New community recreation center. Beautiful White Sand Beach is only 15 miles from New London and 25 miles to Mystic, CT, 2.5 hours from NYC., 35 miles north of New Haven's MTA stop. My grandparents bought this house when they lived in New York City. They spent the entire summers here with my mother and aunt. My grandfather would take the train up on the weekends. Now my aunt and uncle own it and rent it during the season. They spend a week or so at the end and beginning of the summer, vacationing and making improvements on the house. I help them with the online listings like this. My mother, aunt and myself and our families have been coming to this house since we were babies. It's a safe and special place that still shuts off the water for six months during the winter. The beach house is a warm and welcoming, well loved home full of lots of happy memories. The mile long walk to Griswold point, a bird sanctuary protected by the Nature Conservancy. The small front lawn and the house are shaded by 2 large maple trees. There is a wraparound screened-in porch where one can watch the water and listen to the waves. We now have an outside shower. Tenants can take part in a recreation program for kids and there's a Community Center for events. White Sands Beach is a quiet and safe community, great for the summer and peaceful and beautiful in the spring and fall. toilet, shower, On back porch by kitchen door. Good for de-sanding. Towels are not provided unless a request is made to the owner. Beach is directly across a small lane, about 50 feet. 200 or so feet to the water's edge (long island sound). Large screened-in porch. Water seen from porch, living room, dining room, and three bedrooms. Land line with one mobile phone. Electric with thermostat in each room. 3 cars back to back. Classic electric with all new burners/wires. 19' down, 17' up. With cable. At community rec center walking distance. A fantastic community for kids. There's a recreation center run by the White Sands Beach association within a 10 minute walk that has a tennis court, baseball, swimming lessons, etc. 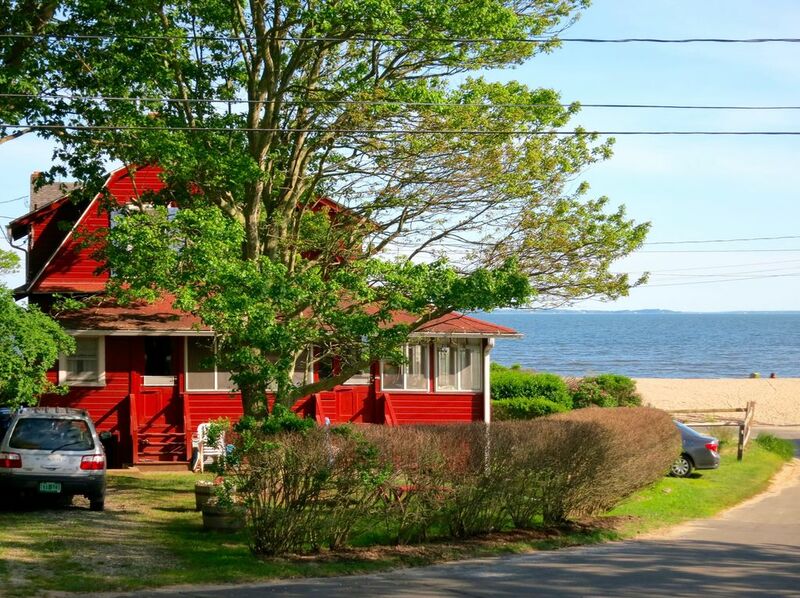 Its only a few steps to the beach and the calm water of Long Island Sound. We love our house and we'll work with you to make sure it's the right one for you. Then backyard and picnic table were terrific, and the view of the beach was fantastic. The house was well-stocked with beach chairs, an umbrella, and a variety of other beach-related gear. The towels provided could have been better, and we appreciated that sheets were supplied although they typically are not included and you are asked to bring your own. A large supermarket, package (liquor) store, seafood market, and farmers market are located within five minute drive. There is also a wonderful ice cream stand & hamburger shack nearby that had great fried clams. We had a wonderful time with our family over 4th of July. As others have commented, the location of this house couldn’t have been better. It’s about a minute from the beautiful beach. You can actually hear the ocean waves from the bedrooms. As for the house itself, it’s unique, with its vintage feel and decorations. Stepping into it is like entering another era. The living room is super large, and the sun porch is perfect for relaxing, reading, or enjoying the view. Everything we needed was available, from utensils to spices, and we had plenty of hot water for bathing, which most rentals don’t offer. Yes, the house could use a few updates (maybe air conditioning for those 90 degree nights) but overall, we wouldn’t change anything. Maya was welcoming and responded quickly to my questions. My husband and I thoroughly enjoyed our week at the red house. It was just what we needed, and we plan to return as often as we can. Excellent location, beach was nice, lots of shells to find. House was nice but could use a few basic upgrades, new tv, dvd player, maybe ceiling fans. Location can't be beat! Very "cottagy" inside but spacious downstairs with huge screened in porch where you can sit and see the beach. WSB is one of the best beaches in CT, in my opinion. Although we have been to White Sand Beach many times in the past, this was our first stay at this cottage and it was fabulous. It met all our expectations of what a cottage at the beach should be: large, roomy, comfortable in a great location with a view of the beach and water. The kitchen was well stocked with everything you might need to cook - although we didn't cook much. What's a vacation for if not to eat out and take advantage of nearby great seafood? The bedrooms were roomy and bright with comfortable beds, plentiful bureaus and closets for storage; and the claw-footed tub heaven to soak in! Our favorite thing about the cottage was the big screened-in porch overlooking the beach. The perfect place to hang out, gaze at the water and people watch. The cottage was immaculate, well-maintained, and well stocked. Maya, the owner, was great: pleasant and responsive. We can't wait to go back next year. I agree with the previous review - you would be hard pressed to find a better location. We rented the cottage for a family reunion; five adults, two children and it worked out great for all our needs. If we weren't at the beach, we were on the screened in porch - perfect for meals, games, reading, visiting - The beach is very safe for children and the views are spectacular. The walk to the bird sanctuary is beautiful, but as everyone warns, check the tide tables and do this at low tide. The signs were gone when we were there as the piping plovers were nesting and the reserve itself was closed, so we only walked on the rocks near it and not into the reserve. The cottage is a comfy, older cottage and the pictures provided by the owner are spot on. The bedrooms are all upstairs and therefore might be a challenge for some. The new outdoor shower was an excellent addition. We all used it to get sand off and rinse off beach shoes. It worked out great. It's not enclosed, but has both cold and hot water, so the kids never hesitated or complained about rinsing off after a day on the beach. We found the owner to be wonderful to deal with, helpful and willing to answer any and all questions we had prior to booking. The neighborhood beach community was quiet the week we were there and perfect for family walks. We would not hesitate to rent this property again. All in all an excellent week full of wonderful memories.....and yes, we had a ice cream jar filled with money which the kids just loved. The ice cream truck is a daily fixture, visiting at least 2 or 3 times throughout the day. We actually had such great weather we only ate out once and our only site seeing was Gillette Castle one morning. The beach was our main reason to be there and it was wonderful. White sands beach is in Old Lyme CT, a charming small town with an art school and shopping plaza with a hardware, super market and other stores. The larger town of Old Saybrook within 15 minutes, is a full size town on Interstate 95 with an Amtrak train station and commuter rail to the Metro North and other transport in New Haven, CT. Within about 20 minutes in New London, are large malls, major box stores, a ferry, etc. A casino is within 30 minutes. There is a 5% discount for 2 or more contiguous summer weeks. We have Special Offers available for spring and fall.